Inspired by conversations on the FOOD52 Hotline, we're sharing tips and tricks that make navigating all of our kitchens easier and more fun. Today, a very special guest demonstrates how to make mayonnaise (and then aioli). Ah, mayonnaise. The delicious condiment that enhances pretty much anything it's dolloped on. 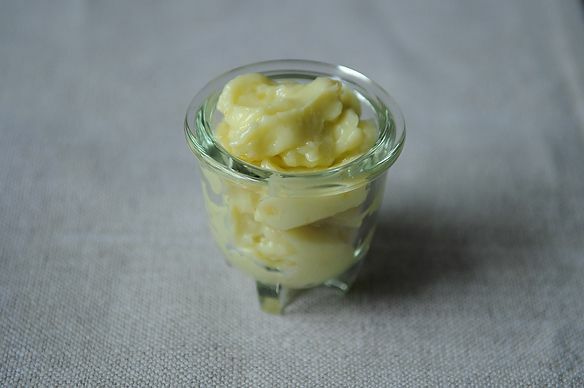 While some of us are fans of classic brands like Hellman's or Duke's, everyone loves homemade mayonnaise. Making it yourself is always satisfying, and you have the added bonus of complete control. It's also really simple to make. Our friend Tamar Adler is such a fan of homemade mayonnaise, she decided to make a video tutorial for us. You may know her book, An Everlasting Meal, a lovely collection of essays about cooking and eating "with economy and grace." Tamar will be sharing tips and tricks with us from time to time because she's all about kitchen confidence, and so are we. An Everlasting Meal is coming out in paperback June 19th, you can preorder it here. Today's video was shot and edited by Adriana Stimola. Not enough garlic for aioli. Looked like you added 1/2 teaspoon. In Provence that would be called a soupcon. I love your book - thank you for offering it via Kindle on Amazon! I wish you (and many other cooks) could offer alternatives to using so much olive oil. Those of us who need to lose weight can't afford those calories (which have no nutrition since the olives have been so processed). While I understand that it's a necessary part of mayo and aioli, you seem to use a lot of it in your book (I have used less in your recipes with great results). I use cooking sprays (sparingly) and vegetable stock and broil things (when I can) instead of frying them. I would love your ideas on how to cook things without adding unnecessary calories. I'm in the same boat as you, tracking what I eat, etc. But aren't Tamar's recipes inherently healthful? You can use less oil, less cheese, and in my opinion, more salt. There are still plenty of delicious meals to be had on your way down the scale, and if you're able to cook most of your meals for the week, eating maybe 3-5 times out sensibly, gradual weight loss is bound to happen. Physical activity is key. I that a 240mm tojiro DP 10 inch knife? love it^^. BTW for those stick blender types (myself included) don't go by the 1 to 1 ratio, eggs vary so much in size, you should start with one egg to half cup of oil, its easier to skimp on the oil, just add more if needed because the flip-side means your mayo will break!! Beautiful!! Add that over some freshly cooked new baby yellow potatoes and some quartered hardboiled eggs and you'll have one of the best tasting potato salads around. Some herbs wouldn't hurt either but that mayo cannot be beat! Skinny Goose - I've asked this on the FoodPickle before and the answer I was given was 3-5 days. Great video. My 'go to' method is the stick blender. Just put ever thing in a glass jar and put in the stick blender--the egg yoke and lemon juice on the bottom and oil on the top blend while lifting up to mix a bit of the upper layer and keep incorporating (on and off switch), adding more oil and water/juice if needed; so, easy and minimal clean up. How long will home-made aioli/mayo keep for? Where do you find that amazing mortar and pestle?? It's a Thai mortar and pestle. They're wonderful because they're so deep, and so there's no splashing. I got mine at the Thai grocery on Bayard street in Chinatown in Manhattan. But I'm sure other Thai and Indonesian groceries carry them. Beautiful! It looks like the ones they use to make somtam. Great little tutorial! Very helpful!